How Can You Strengthen a Weak Area? Everyone has some muscles that do not develop as easily as other muscles. Our ability to tire out our muscles, joints, nervous system, and endocrine system is limitless. You need to know whether each one of your muscles is polyarticular or monoarticular. To understand the difference, consider the example of the brachialis and the biceps. 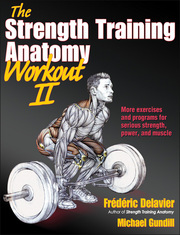 His best-selling Strength Training Anatomy has sold over 1 million copies, and now Frédéric Delavier provides a more advanced way of creating power and mass. Helping accelerate progress, The Strength Training Anatomy Workout II features 60 exercises, 19 stretches, and 9 programs with 500 full-color photos and 485 illustrations. The anatomy of strength, size, and definition! Over 1 million readers have turned to Strength Training Anatomy for the most effective exercises in strength training. Now put those exercises to work for you with The Strength Training Anatomy Workout II. Over 500 full-color photos and 485 full-color illustrations allow you to go inside 60 exercises, 19 stretches, and 9 programmed workouts to see how muscles interact with surrounding joints and skeletal structures and how variations, progressions, and sequencing can affect muscle recruitment, the underlying structures, and ultimately the results. The Strength Training Anatomy Workout II is your guide to serious muscle development. Inside you’ll learn the best exercises for building up and strengthening each muscle; how to determine weights, repetitions, and frequency; and strategies for accelerating recovery. The Strength Training Anatomy Workout II includes proven programming for adding lean muscle mass, improving strength, and increasing power. Targeted workouts allow you to focus on specific muscle groups such as the chest, biceps, triceps, quads, and core. It’s all here and in all the stunning detail that only Frédéric Delavier can provide! The former editor in chief of PowerMag in France, author and illustrator Frédéric Delavier is a journalist for Le Monde du Muscle and a contributor to Men’s Health Germany and several other strength publications. His previous publication, Strength Training Anatomy, has sold more than 1 million copies. A Physiological Dilemma: Should You Slow Down the Negative Phase? Continuous Tension or Full Range of Motion? The former editor in chief of the French magazine PowerMag, Delavier is currently a journalist for the French magazine Le Monde du Muscle and a contributor to several other muscle publications, including Men's Health Germany. He is the author of the best-selling Strength Training Anatomy and Women’s Strength Training Anatomy. Michael Gundill, MBA, has written 13 books on strength training, sport nutrition, and health. His books have been translated into multiple languages, and he has written over 500 articles for bodybuilding and fitness magazines worldwide, including Iron Man and Dirty Dieting. In 1998 he won the Article of the Year award at the Fourth Academy of Bodybuilding Fitness & Sports Awards in California.